Award Winning Wedding Photojournalism eh! I haven’t entered any images for awards for a long time. I probably last entered something 2 years ago or so. I don’t shoot with the intention of entering for awards or submitting to wedding blogs as anyone who has read the various words on this site will know but a couple of the associations I hold memberships with run regular competitions and so recently over the past couple of months I have started to submit an image or two here and there. 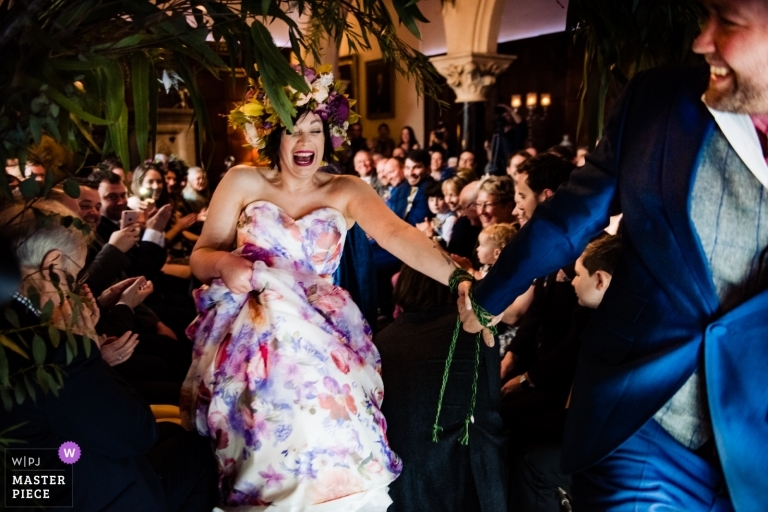 This image from Emma and Mike’s wedding at Huntsham Court in Devon a few weeks ago is one of my recent favourites. The room was crowded and Emma and Mike were exiting the ceremony through a flower arch that really restricted the route they could take and angles I could shoot from, but sometimes limitations can be a bonus. There was really only one shot I could get of Emma and Mike as they left the room and this was it. For me its full of colour and life and really captures Emma and Mike as they are if I say so myself. So this and a handful of other images went into the recent round of judging for the Wedding Photojournalists Association If you haven’t heard of the WPJA, this blurb is from their about page.